Directed by Jay Roach. Produced by Michael London, Kelly Mullen, Janice Williams, Shivani Rawat, Monica Levinson, Nimitt Mankad, John McNamara, and Kevin Kelly Brown. Written by John McNamara. Release date: November 6, 2015. Dalton Trumbo was a Hollywood screenwriter whose most prominent projects came in the 1940s, '50s, and '60s, although his work in the '50s - during which time a film he wrote won a Best Screenplay Oscar - was done using various fronts. Why was this? Well, Trumbo was blacklisted after refusing to testify before the House Un-American Activities Committee, whose job it was to find out if there was a secret Communist plot underfoot in Hollywood - and eventually elsewhere. 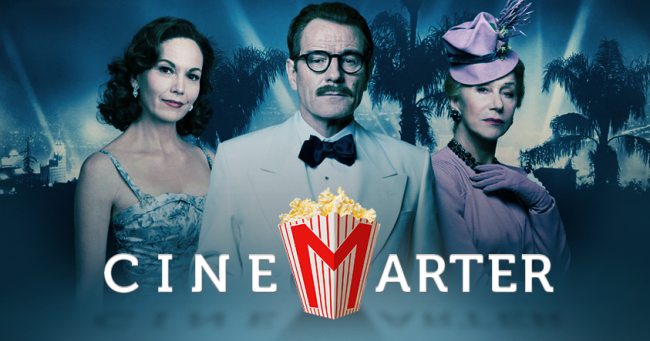 Trumbo tells his story, and showcases a man who believed that standing on principle, and standing up for one's values, is worth more than anything else. 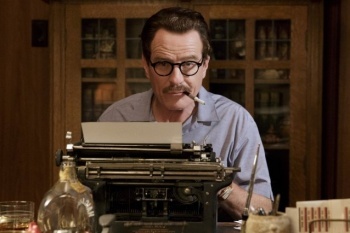 Trumbo is played by Bryan Cranston, an actor who ensures that every line of dialogue is said with such an importance, and such witticism, that it is captivating. The film even comments on this as it's playing. Trumbo was a member of the Communist Party back when Fascism was America's greatest fear, but after WW2 and the Soviet Union became the nation's enemy, a magnifying glass was turned inward toward former - or current - Communist Party members, in order to ensure that no American secrets were being leaked to the Soviet Union. Dalton Trumbo was called to testify, but refused, and served a significant time in prison as a result. After being released, he became blacklisted by the studios that ran Hollywood and found himself unable to work. Several other prominent people in Hollywood were in similar situations - the Hollywood Ten, they were called. Watching these events taking place from 2015 is a shocking - and, at times, hilarious - experience. The absurdity with which the events proceed seems like a joke - as if this sort of thing couldn't have taken place. But it did. If Trumbo does nothing else, it'll inform the public of these atrocities. This isn't a topic that gets brought up very often - especially in the movies - and it might be one with which the general public is unfamiliar. Trumbo is an informative biopic, and one of its main strengths is simply being educational.